Made in the USA. 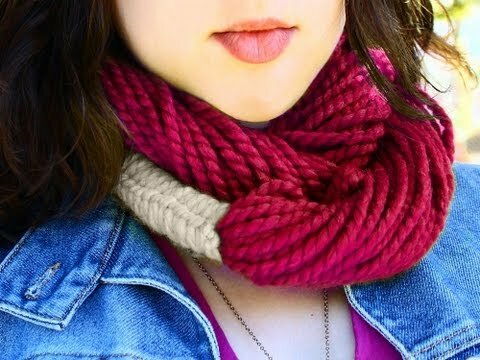 Handmade alpaca wool & acrylic mix scarf that provides warmth and wears multiple ways as a necklace, scarf, or neck warmer. Comes packaged in giftable storage bag. The scarf is a beautiful blue color and goes great with jeans. It lays real well and is soft and warm. I really like it. This is an innovative, attractive scarf that is affordably priced. It made for the perfect gift. I would buy it again. 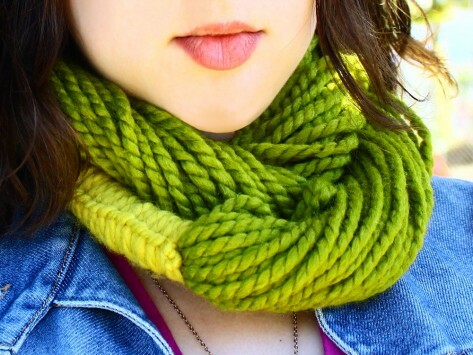 Aria Handmade takes a new twist on a classic accessory with its innovative interpretation of the infinity scarf. Multiple wool strands are gathered together for a simple, elegant look available in a variety of bold, bright hues. Whether worn loose and long like a necklace or twisted and wrapped twice around for a more snug and cozy fit, Aria scarves drape and hang with ease and beauty thanks to a unique blend of alpaca and acrylic formulated by designer Nestor Pineda. Despite what appears to be a rather simple design, Aria scarves are actually quite difficult to make. Each scarf is handcrafted in North Carolina by a group of local women trained by Nestor himself. Sourced from local farms in the Asheville region, the alpaca wool is prickle-free, hypo-allergenic, soft, durable, and water repellent. Aria Scarves add a splash of color and unique style to any outfit or coat—the perfect statement piece and cold-weather accessory all wrapped into one.